Membership in SSWA is open to Manufacturers and Wholesalers (Redistributors) doing business in the sanitary supply industry. 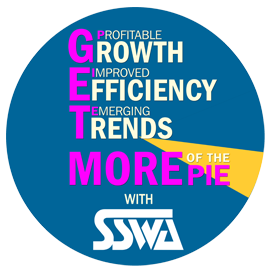 Members are eligible to attend the annual SSWA Executive Conference and the annual SSWA Membership Reception held in conjunction with the ISSA Interclean trade show. The Executive Conference is a 3-day event which includes segments for education, networking, and socializing, as well as pre-scheduled Person-to-Person meetings. Members are also exclusively eligible for the SSWA Scholarship Award through the ISSA Foundation. Eligibility for receiving this award is based upon the applicant being a college student or a student pursing an advanced degree. The individual must be related to an employee or owner of an SSWA member in good standing. Sponsorship opportunities enable added exposure throughout the year. Annual Dues are $995.00, and participation in the annual Executive Conference is strongly encouraged, with a fee of $1595.00 per delegate.